1. 친절한 직원 : 먼저 찾아오고 밝게 웃어주는 직원들이 최고의 장점이라 생각됩니다. 직원의 친절함은 정말 최고입니다. 캐쥬얼한 직원들의 복장도 좋았습니다. 2. 밝고 깨끗한 호텔 : 입구에서부터 밝은 기운이 넘쳐 납니다. 깨끗하게 잘 관리되고 있는 호텔은 보기만 해도 좋습니다. 3. 위치 : 스테이션2에 위치하고 디몰까지는 느린 걸음으로 10분정도 걸린듯 합니다. 호텔앞에 바로 해변이 이어져 있어 바다까지의 접근성도 좋습니다. 4. 정수기 : 정수기가 룸 가까이 있어서 기본 제공되는 물 외에도 부담없이 마실 수 있어 좋았습니다. 5. 넷플릭스가 가능한 TV : 넷플릿스로 킹덤 다보고 왔어요. 7. 기타 : 무료 팝콘이나, 레몬물, 아이스크림 등등 계속 생각나는 좋은 호텔입니다. 2. 방이 좀 작고(작지만 알찬 구성), 창문이 없었구요, 복도쪽이 벽이 아니라 유리라 커텐을 내리고 살았구요. 방음이 좀 잘 안되는 느낌이었습니다. 3. 세면대 수전이 왼손잡이용인듯...수도꼭지가 오른쪽에 치우쳐 있고 오른쪽에 비누가 있어 비누를 잡고 물을 틀기 어려운 구조입니다. 비누를 왼쪽으로 옮기면 그나마 낫습니다. 사실 단점이 모두 커버될정도로 장점이 더더욱 훌륭한 리조트 입니다. 이틀 숙박후 페어웨이로 이동하였는데 가족 모두가 코스트를 그리워 했네요..
부모님, 동생가족, 우리가족 총 8명 여행갔습니다. 방은 3개 빌렸고 방 하나는 킹사이즈,퀸사이즈 붙어있어서 아이들 2명과 성인2명이 잠자기 충분했습니다. 수영장 시설도 괜찮고, 썬배드에 누우면 직원이 바로 수건, 물 셋팅해서 가져다 주고 아이스크림, 팝콘도 가져다 줍니다. 그냥 편안하게 놀다가 수건으로 물기닦고 다른곳으로 이동하면 깨끗하게 정리해둡니다. 비치에도 마찬가지로 호텔앞 비치로 나가면 직원이 돗자리와 수건 배게 셋팅해주고 수시로 물가져다 줍니다. 수건도 부족함 없이 채워주며 매일 저녁 간단한 디저트도 좋았습니다. 위치도 좋아서 디몰까지 걸어서 10분, 근처 맛있는 식당들이 많아서 식사도 잘했습니다. 머무르는 3박동안 친절한 서비스에 감동받고 갑니다. 어느 다른 최상급 호텔을 가도 이렇게 기분좋게 서비스 해주는 곳은 드물 듯 합니다. 픽업샌딩 서비스도 만족했고 조식도 너무 맛있었습니다. 디몰과는 약간 거리가 있지만 걸어다닐만 합니다. 생일인 투숙객이 있으면 조식먹을 때 생일파티도 해줍니다. 덕분에 보라카이에서 좋은 추억 만들고 가네요. 보라카이 숙소로 두번 세번 추천합니다. 정말 깨끗하고 룸도 예쁩니다또한 위치가 좋고 바로 나가면 비치타월같음걸로 자리도 깔아줘서 너무 좋아요그리고 차차카페 너무 맛있어요 뷰도 환상이구요 조식 말고도 저녁 요리 먹어봤는데 신선하고 좋았습니다룸 컨디션도 좋고 웰컴 주스랑 과일도 있고 넷플렉스도 되더군요단점이라면 엘리베이터가 없고 방음이 취약하다는 점이 있습니다. 근데 저흰 피곤해서 잘 잤지만요..ㅎㅎ 아 또 한쪽 벽면이 전면 유리창이라 그게 좀 부담스럽다는 것?전반적으로 너무 좋았어요! First off, thank you for choosing COAST as your residence in Boracay Island as we know there are several hotels to choose from. We are fortunate to have you as our valued guest and happy that we did not disappoint. We are grateful you took notice of the cleanliness and beauty of COAST, the spot-on location of our property which you mentioned is also an advantage, located at the center of the 4KM white sand beach is truly convenient since we are near the popular restaurant, bars and shops. Thank you for taking the time to write your review in TripA, your kind and sincere words will further fuel our motivation to be consistent in our service. We are happy you chose Coast as your residence in Boracay Island as we know there are several hotels to choose from. We are fortunate to have you as our guests and we take pride in providing genuine Filipino hospitality, hence, we are grateful that you experience kindness with our staff. We appreciate the mention. Quest35352486499, we are grateful for your patronage and we look forward to be of service once again in the near future. Meantime, we wish you all the best and more Funshine travels ahead. Thank you for your kind review, our staff is very happy to read your positive comments. We are glad that we did not disappoint and we appreciate it very much that you stayed at COAST. We are grateful that you took notice of our clean rooms and kind staff. We hope to see you in the near future. 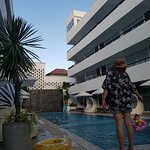 JiheeS27, we send you our warm regards and we wish you more funshine travels ahead.